WASHINGTON (CNN) - Few Virginians would describe Creigh Deeds as a great speaker. The Democratic candidate for governor frequently fumbles his words in press conferences and on debate stages. The Washington Post has described him as "stammering." Now a top surrogate for Republican candidate Bob McDonnell is drawing some unwanted attention for outright mocking the Democrat's halting manner of speech. Sheila Johnson, the co-founder of BET and one of the McDonnell campaign's most high-profile African-American backers, made fun of Deeds during a campaign event in Hampton Roads two weeks ago. The video of Johnson's remark was captured by the Democratic blog NotLarrySabato and posted online Monday. "We need people who can communicate," Johnson said at the event, as McDonnell stood by in the audience. "And Bob McDonnell can communicate." Johnson then said other politicians she talks to can't communicate, "especially his op-op-op-op-opponent." The Deeds camp called it a "personal attack." "Creigh's the first person to admit that he's not the smoothest talker and that he sometimes stumbles over his words," said Deeds spokesman Mo Elleithee. "But at least you know that what's he's saying is authentic, honest and true. That's what voters will respond to, not petty personal attacks." The McDonnell campaign did not immediately respond to a request for comment. UPDATE: The McDonnell campaign claimed Johnson was simply accusing Deeds of straddling the fence on campaign issues. “Creigh Deeds has been unable to express any vision for Virginia’s future, and he regularly takes two positions on important issues," said McDonnell spokeswoman Crystal Cameron. "Democratic businesswoman Sheila Johnson was noting that fact. Why the Deeds campaign wants to attack a prominent supporter of both Governor Tim Kaine and President Barack Obama, while reminding voters that she strongly supports Bob McDonnell for governor, is beyond us." The GOP once again shows its higher merits - making fun of a speech impediment. Wow, too bad the guy isn't in a wheelchair - they could really have fun with that! I can see Canada from my house! My son has a stammer, and he has autism and Tourette's Syndrome. In spite of this, he raised over $400 in one weekend selling popcorn for his Boy Scout troop. If people in a working neighborhood who are struggling to get by can take the time to listen to an 11 year-old selling popcorn, the people of Virginia should be able to listen to a man with a stammer for Governor. Its pathetic that the co-founder of a network charged with raising public awareness of people of color could be so crass and shallow as to attack a person for having a stammer. Maybe she should pay more attention to the intentional butchering of the English language taking place every day on her network. When Bush misspoke it was a problem. Now a democrat governor candidate misspeaks and it's defended. Hypocritical again. 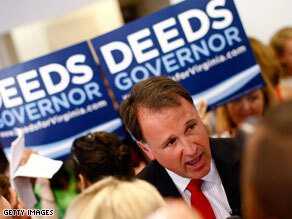 Deeds has my vote.. .Proud Deeds supporter. Wow. That's truly pathetic. This is the kind of leadership the republican party has to offer? Making fun of someone for what could be a legitimate speech impediment? Right or Left, that crosses a bit of a line. This joke from someone who started BET a TV station that further sterotyped and demoralized Urban American youth and corrrupted morals. I have no respect for either MS. or Mr. Johnson. One day people will realize politics is all about power and money..... The Johnson's are really concerend about their own bank accounts. The update is even more pathetic. So, the mimic of a stutter is supposed to represent Deeds being on the fence over some issues? That doesn't make any sense. Someone is either a liar or an idiot. I think American would rather have someone who fumbles his words over someone who fumbles his life, beliefs, morals and is incompetent. Very classy, GOP. Your guys feign shock and horror that Deeds addressed a reporter as "young lady". Meanwhile, a McDonnell supporter mocks Deeds' speech impediment in front of a crowd. Basically, you've got nothing, GOP. Least of all, class. Sheila Johnson is a joke–she should be ashamed and embarassed! Now if that was Palin she would be saying "you are mocking someone with special needs" Republicans do anything to distract because they have nothing to say with substance! How Christian. Mocking a speech impediment. Fits right in with kicking the poor, stealing from the middle class to enrich the wealthy, returning women to 2nd class status, bashing minorities, trashing the environment, and all those other conservative values we have all come to expect. 'course calling a young lady a 'young lady' is so much worse. bush mispeaking was a matter of intellect, not a physical impairment. Ditto for palin. Mocking the CONTENT of what they said is not the smae as making fun of someone with a speech impairment. Anyone that has made it past 1st grade knows the difference. This is the smae desperate politics of fear, hatred, and derision that characterizes todays republicon party. how they have more than a tiny handfl of supporters both boggles the mind and frightens anyone with half a brain.